They finally made to my K-Mart! Picked up a couple, gonna pick up another next time I need to go there. Here’s the good stuff from these two. 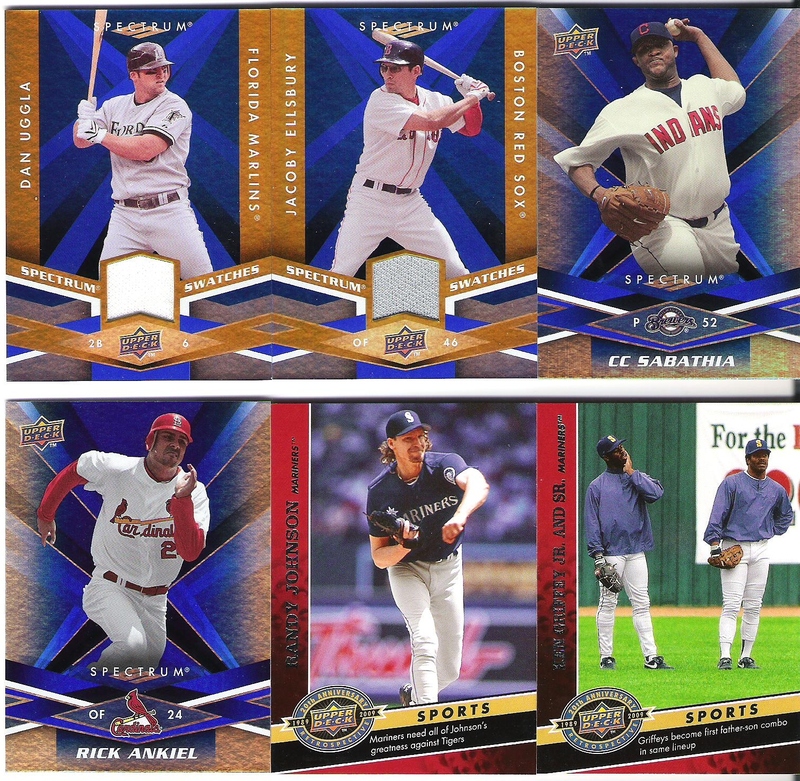 Uggla Jersey, Ellsbury Jersey, CC Blue, Ankiel Blue, Randy Johnson 20th Anniversary, Griffeys Sr. y Jr. 20th Anniversary..
20 cards, an insert, a parallel and a jersey per blaster. Not bad for $5.99 apiece! It makes pulling a lame jersey a lot easier to swallow. Fortunately, both of these were pretty good. All I’m keeping Griffeys Sr. y Jr., but the rest are available. Also, isn’t someone out there collecting the 20th Anniversary Retrospectives? I have a bunch I can send them. That’s all for now. Thanks for stopping by! 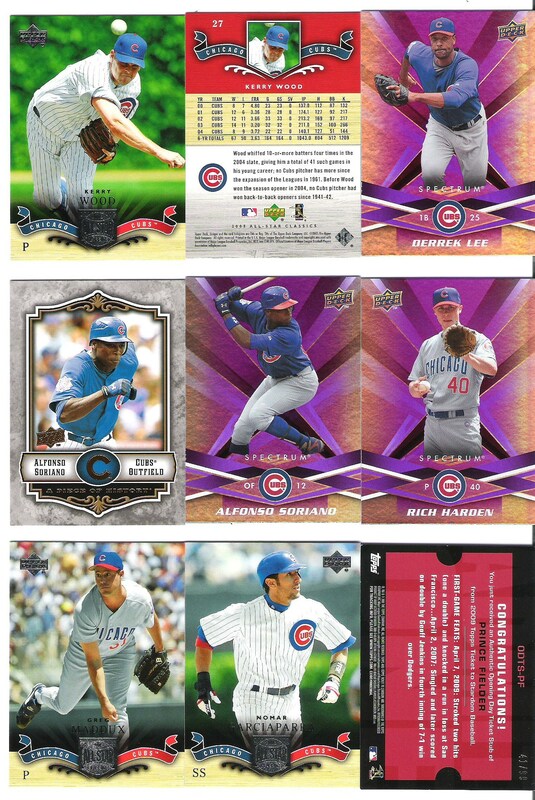 I got my prize winnins from Cardboard Problem and a fresh trade from Heartbreaking Cards at the same time and scanned them at the same time, so I might as well post them at the same time. Plus I’m not sure which came which on one of the scans. I may have mixed them on it, I dunno. Anyway, pretty pictures ahoy! The *literally* big prize. 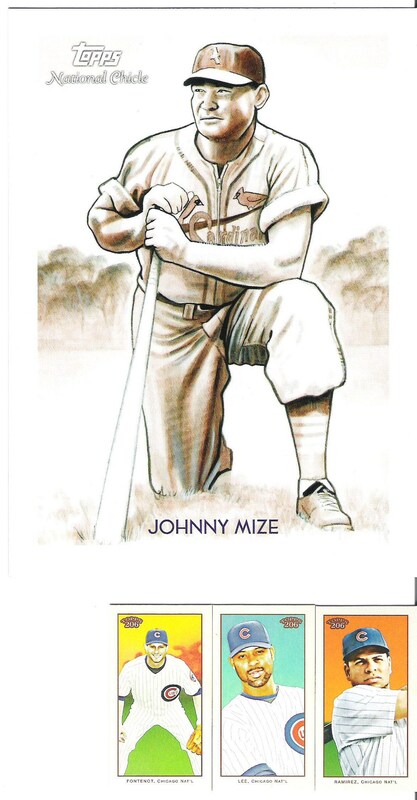 Johnny Mize cabinet card. Though a Cardinal, it's one of the prettier looking cards in the entire set, in my rarely humble enough opinion. 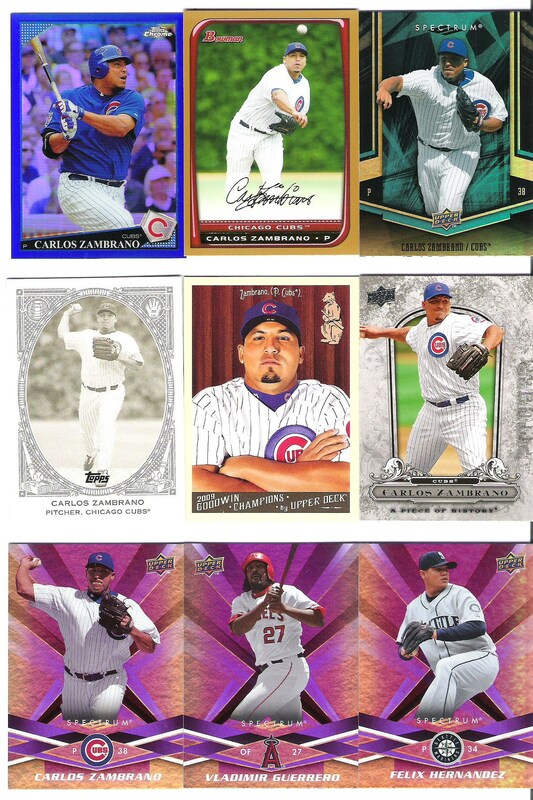 And three mini 206 Cubbies (only one still with the team) for scale and because I couldn't fit normal-sized cards on the scanner bed with giganto Mize. 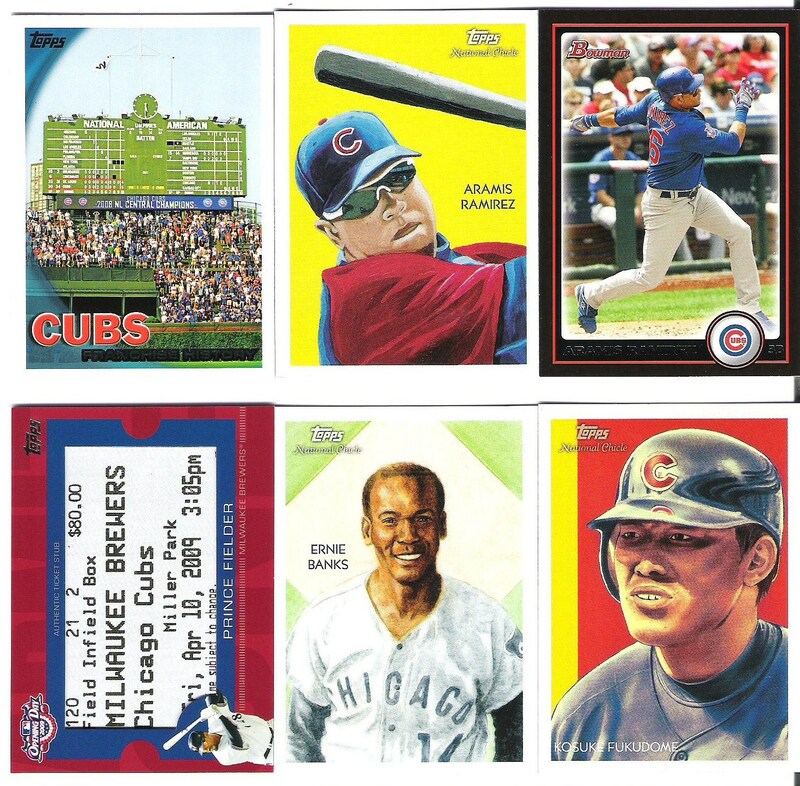 I mentioned something somewhere about this being my first contest win, but I actually won a contest at White Sox Cards awhile before. Slipped my mind due to how quick that one went down (half hour, give or take). And the rest, maybe. But what nice filler it is. All-Star Classics is one of my absolute favorite sets of the entire past decade. Been wanting a box for eons. Now it’s definitely on to the Heartbreaking part of this post. 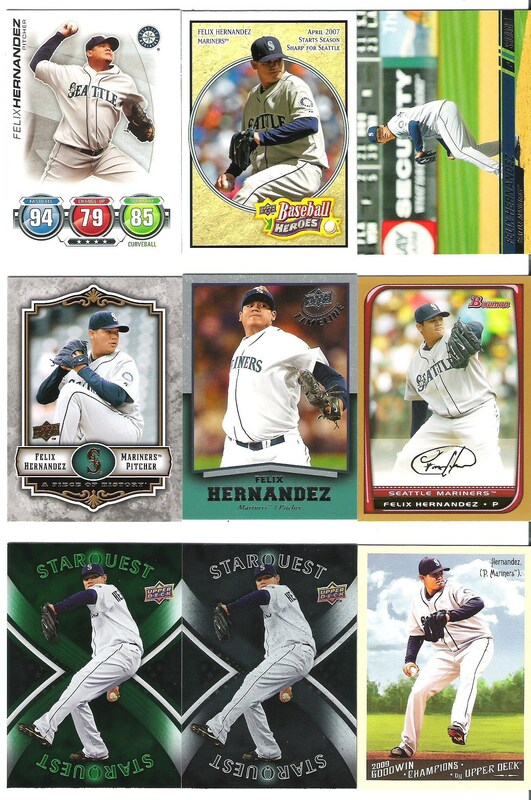 The King Felix collection gets some rare lovin' thanks to Matt. Noice. Even though the D-Lee collection was officially closed almost immediately after this (but well before he was actually traded), that mmiddle row is freakin' sweet. And a new Kosuke (the Documentary one)! 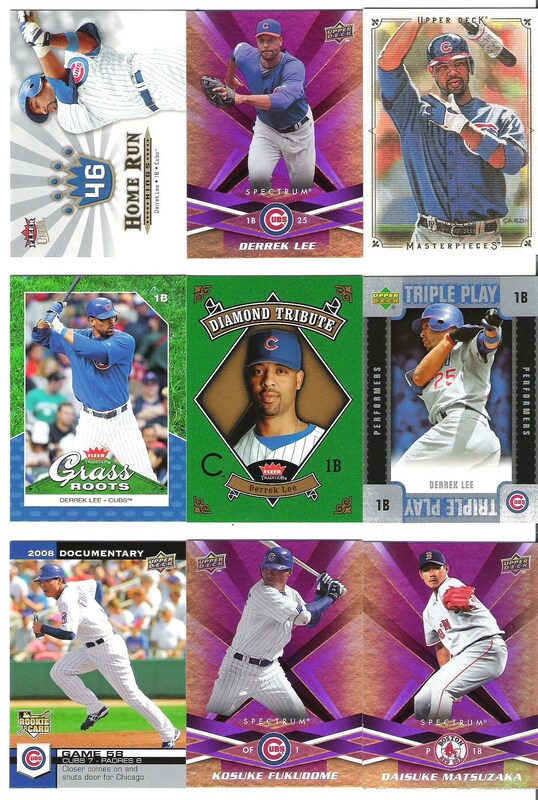 Finally, the two cards that keyed this trade in the first place, the blue Fukudome & Vlad parallels. Also a cool D-Lee segueing into his tenure with the Cubs. Great awesome cards. Marie and Matt should both be expecting something in the mail before too long. And with that, I’m outta here.